Sweet,little Rowan died unexpectedly on Monday, June 9. There were no signs that he was sic. He had been playing, acting normallly, eating well and pooping like a champ. During our Rabbit Meetup group he started having seizures and we began bunny CPR and energy work, but it was clear that he was almost gone. He died minutes later in Rob's and my arms. We did not do a necropsy on him, but understand that while he was at Marin Humane Society he had a history of stomach problems, so we feel he likely had a stomach issue that quickly became septic and caused seizures. Marin works with an animal communicator who said that Rowan had had a good life and was ready to move on. Marin Humane Society is building a vegetable garden for the rabbits and it was be called Rowan's Memorial garden and his ashes will be spread there. I will be doing a mosaic piece. Rest in peace little boy. He wasn’t a rabbit that you would especially notice. He was white with brown spots over his body and black spots on his tail. He was large. He was in most ways just a “typical rabbit”. He wasn’t what most adopters want. They are drawn to the lops and the dwarfs and the woolies. But Rowan was no ordinary rabbit. In his short life he touched the lives of hundreds of children. He was a rabbit ambassador. He was a “super bunny”. Rowan Rabbit came to the Marin Humane Society in the spring of 2007. Like many of our animals, he had been someone’s pet. In the beginning he was loved and cared for, but as time went by and the people’s lives moved on, he became less of a priority until one day he was not a priority at all. Neighbors found him on his own, trying to stay alive the best he could. They brought him here with the hopes that someone would fall in love with him. Marin Humane Society’s Animal Care Camp started soon after he arrived. Every morning we select a rabbit to spend the day in the classroom in an exercise pen. The children enjoy getting to spend time with a gentle animal and the rabbit gets stimulation and space to romp. Rowan quickly became the “go to” rabbit for camp. He was the first chosen each week and the one the campers asked about. He became our unofficial camp mascot. As the summer wore on most of our bunny visitors got adopted. But Rowan was still here, dependable as always. He seemed to look forward to his visiting days and really interacted well with the children. And then camp was over and his visiting days were over, as well. For a few weeks he socialized with our other rabbits in “Rabbit Romper Room”. And then we began our fifth and sixth grade volunteer group, Animal Care Club. And this is where he really began to shine. Rowan was the rabbit that everyone wanted to sit with. He was the one that everyone wanted to adopt, if only they were able. One girl, in particular, fell head over heels in love with him but with a new baby on the way and a large family, it just wasn’t possible. So she became his honorary “Bunny Godmother”. This special relationship allowed her unlimited visits with her “god son” and she really made the most of them. Rowan was the recipient of many tasty treats during the year. By now Rowan had been here for ten months and though he was everyone’s favorite, he was no closer to being adopted than he had been when he first arrived. The decision was made to send him to Save A Bunny in the hopes that he would finally find his “forever home”. Unfortunately, Rowan passed away in June, never having found what he most deserved. Rowan made such a difference in so many lives. For me he was the first rabbit with which I ever fell in love. He set the standard for all other bunnies. There will never be another Rowan and we are poorer for it. Ordinary looking? Maybe. But ordinary? Never. And he will live on in our hearts forever. Hi! My name is Rowan and I am simply a great bunny guy. I am not being conceited at all, but rather, just passing along the opinions of volunteers both at Marin Humane Society and SaveABunny. 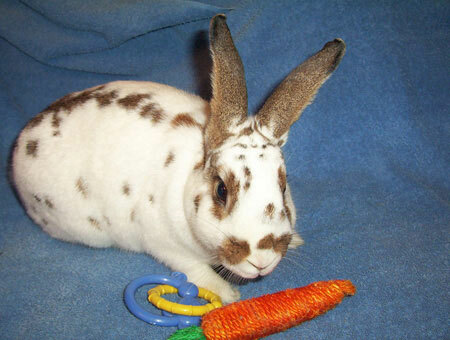 I'm an active fellow who really enjoys exploring, doing bunny binkies and making new friends. Sometimes people think "mutt" bunnies like me just aren't flashy or exciting enough, but let me tell you..there's nothing better than a tried and true all American mutt bunny. We tend to be healthier, heartier and just easier than fancy breeds, and aren't you really most interested in finding the best personality fit anyway? Think of me as the "bunny boy next door", an All-American man and you will quickly be charmed by my simple good looks and winning way.